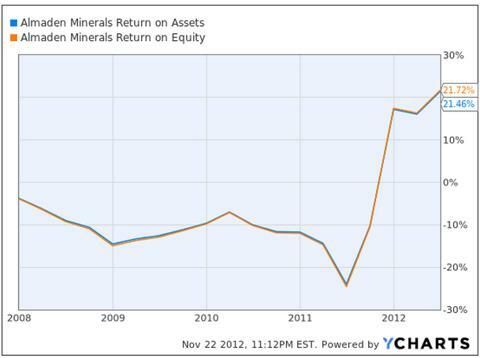 Investors in Almaden Minerals (AAU) have many reasons to be disappointed with this year's gain of around 2%. The high levels of volatility and a 400% stock price gain in 2010, followed by a 50% decline in 2011 have left many investors frustrated with this security. Through this article, I will examine some of the fundamental drivers of AAU and present the case that prudent investors should consider cautiously adding this security to their portfolios. 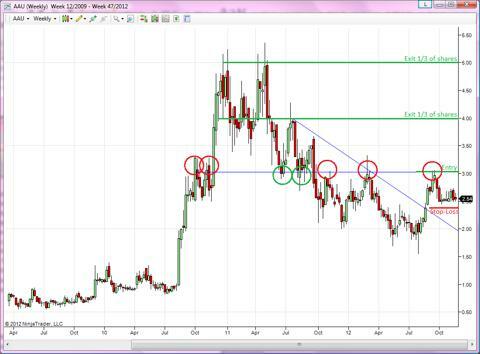 I believe that analysts should be very objective when studying securities with high levels of volatility. When the potential for large profits or losses is prevalent, individuals can become compromised by allowing greed or fear to influence decision making, rather than intelligent analysis. In order to objectively analyze AAU, I have relied heavily on return on assets and return on equity. Return on assets is the net income of a firm divided by average total assets. Return on assets tells the analyst how efficiently management uses assets to generate profits for the firm. Return on equity is the net income of the firm divided by directly-invested shareholder equity. This figure tells a researcher how well management utilizes investment capital to bring a return of income into the firm. 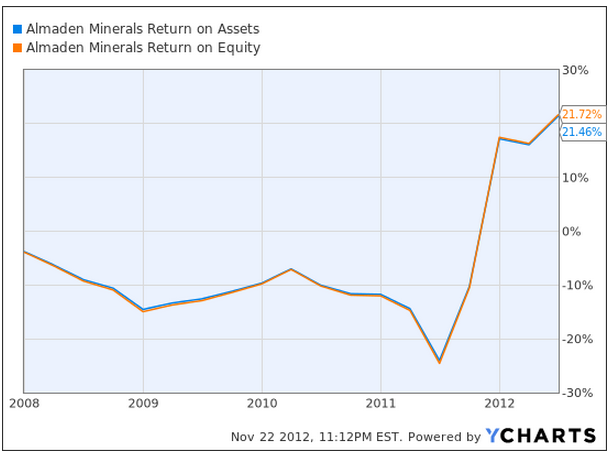 The chart below shows 5 years of return on assets and return on equity for AUU. The first thing that is immediately evident is that AAU has almost identical returns on assets and return on equity for the past 5 years. This is very important in that it means that assets and shareholder equity are held in proportion to profit by the organization. Essentially, this means that management and shareholders have an equal vested interest in the success of this organization since the assets of the firm are almost identical in relative value to the investments of shareholders. The next thing that we should note is that return on assets and return on equity tend to improve or degrade in trends. That is, as performance increases in a given quarter, it tends to continue increasing until a reversal. This trending quality allows us to fundamentally analyze the firm in stages. Beginning in 2008, AAU experienced a decrease in firm performance as measured by return on assets and return on equity. This decrease in performance lasted until the beginning and 2009 and the stock price responded by decreasing nearly 80%. In 2009, the firm began a process of fundamental improvement and it grew its returns until the organization peaked in the first quarter of 2010. This period of growth was marked by an increase in share price by nearly 50%. In 2010, the firm declined until a sudden surge in fundamental performance in the second quarter of 2011. This surprise in earnings erased a full year of share price malaise and increased the security by over 300% in a few short months. This fundamental growth continued until the first quarter of 2012. It is my belief that this gain of 300% was an overreaction to a season of earnings surprises in which the organization was able to propel itself to sustained profitability for the first time in over 10 years. Remarkably, the improved firm performance during the second half of 2011 actually led to a decline in share price of around 20%. The firm continued its fundamental improvement in the second quarter of 2012 and share price responded by erasing the losses of the previous period of decline. A breakdown of this history can be seen in the table below. As I noted on the table, I find it very important that over these past 3 quarters, the firm has improved and the share price has essentially gone nowhere. In my opinion, this lays the groundwork for a fundamentally-rooted investment opportunity. The clear relationship which we've noted is that as the firm improves, the stock price tends to improve as well. Additionally, the market seems eager to reward AAU for any increase in firm performance in that even during a period of decline, the market added several hundred percentage points to the share price when the organization experienced positive earnings surprises. What is truly noteworthy is that AAU is an improving firm, however the market has not continued to add value to its shares. This is a decoupling between firm performance and stock price performance, and I believe that it warrants an investment. History has shown that returns tend to drive share price and the recent increase in returns should be driving the share price to new heights. In light of the current share price malaise, I recommend investors consider purchasing this security. Even though I advocate purchasing AAU, I do not believe investors should immediately act on this advice. AAU is a very volatile security and investors would be wise to understand that with volatility comes risk. As seen in the chart below, I believe that investors should purchase the security if a week is able to end above $3.00 per share. 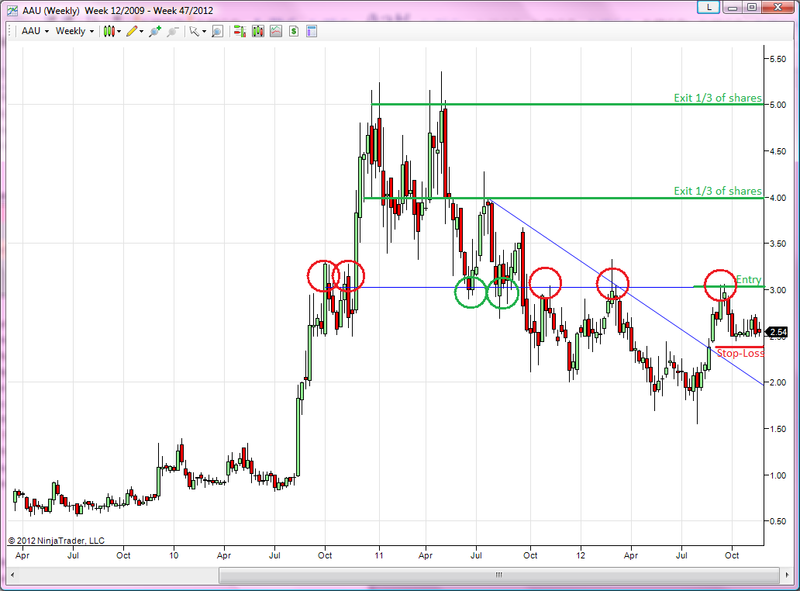 This level has been hotly-contested over the past two years and price has found both support and resistance here 7 times, as circled on the chart. For investors purchasing the security at $3.00 per share, I believe that they should strongly consider placing a stop-loss at $2.40 to protect capital in the event of this analysis being incorrect. My thesis is that the share price will increase in the future due to strong fundamental performance and a close below $2.40 will signal the possibility of further price downside on a technical basis. In order to lock in profits, I believe that investors should exit one-third of all shares at $4.00 per share. This has been a highly-contested region in the past, as seen on the chart, and I believe than an exit here is appropriate. If price is able to continue its upward momentum past this point, I believe another third of shares should be exited at $5.00 per share. This also has been a region at which price has struggled. For the remaining shares, I recommend that investors let profits ride until fundamental performance decreases, as measured by return on equity and return on assets. In the event that this analysis unfolds as predicted, I believe a final stop-loss should be placed at $4.50 and investors should continue to hold until a downtick in returns. The table below shows the expected payoff from this investment as well as a breakdown of all recommendations. This is a favorable trade in that one can expect, in the base case, to earn $2.50 for every $1.00 he or she is willing to risk. 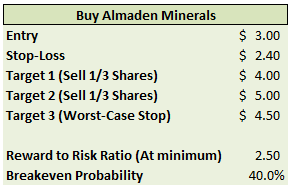 Additionally, if this analysis even stands a 40% chance of being correct, an investor is wise to buy Almaden Minerals.